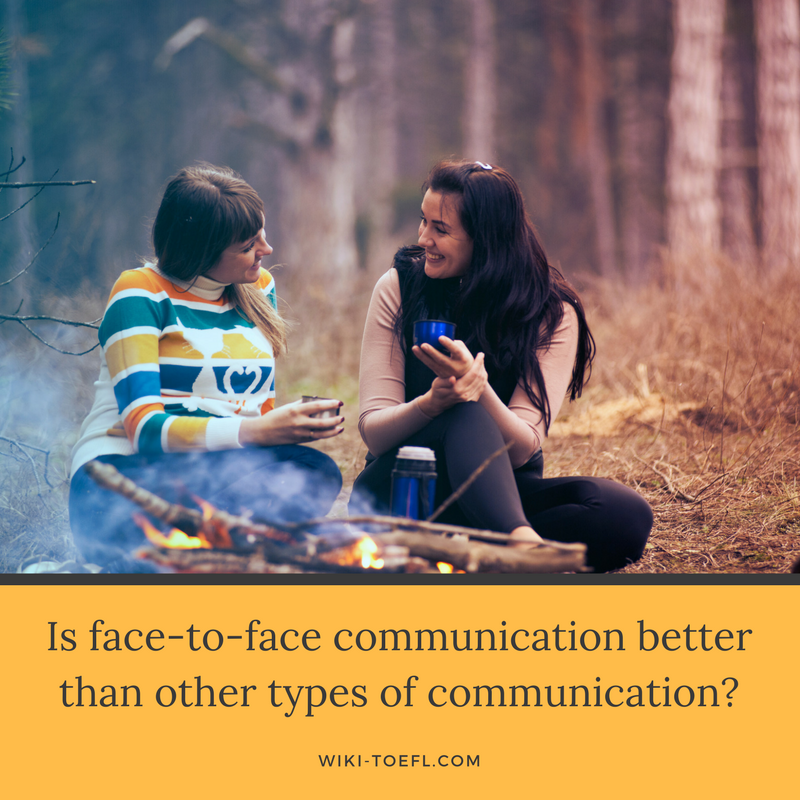 Do you think face-to-face communication is better than other types of communication? Home Writing	Do you think face-to-face communication is better than other types of communication? Do you agree or disagree with the following statement? Face-to-face communication is better than other types of communication, such as letters, email, or telephone calls. I would have to agree that face-to-face communication is the best type of communication. Face-to-face communication can eliminate misunderstandings immediately, cement relationships, and encourage continued interaction. Toefl writing: How do movies or television influence people’s behavior? If you are talking to someone directly, you can see right away if they don’t understand you. A person’s body language will tell you they disagree or don’t follow your line of thought. You can repeat yourself or paraphrase your argument. If you had sent an e-mail, the person may have misinterpreted what you wanted to say. He or she could be insulted and you would have to waste time explaining yourself in another e-mail. When you talk face-to-face, you communicate with more than words. You communicate with your eyes and your hands. You communicate with your whole body. People can sense that you really want to communicate with them. This energy bonds people together. Your relationship with a person can grow much stronger when you communicate in person. Face-to-face encounters tend to go on longer than other forms of communication. An e-mail lasts a second; a telephone call, a few minutes. However, when you meet face-to-face, you’ve made an effort to meet with the person, and the person has made an effort to meet with you. You will probably spend longer together talking. The longer you talk, the more you say. The more you say, the stronger your relationship will be. In summary, if you want to establish a relationship with another human being, the best way is talking face-to-face. When you communicate directly, you can avoid misunderstandings that may occur in writing. You can communicate on levels other than just words and you can spend more time doing it.